RØDE was extremely proud to be a contributor to the recent Levi's Los Angeles Film Workshops, housed inside the Geffen Contemporary at MOCA during the Art in the Streets exhibition. Running from April to August, the workshop was designed to entice visitors into filmmaking by providing free equipment use in addition to a range of free lectures and tutorials by respected industry professionals. The exhibition attracted over 200,000 visitors, breaking museum attendance records, and saw a number of high profile guests including Spike Jonze, Werner Herzog, Michael Rappaport, The Beastie Boys, No Age, Money Mark and many more. RØDE Microphones was the exclusive supplier of microphones to the exhibition, supplying a range of broadcast quality microphones including several VideoMics, VideoMic Pros, Stereo VideoMics, NTG-2s and Lavaliers, as well as a collection of boompoles. Almost 3,300 short films were produced during the workshop, ranging from documentaries and artist films to action packed skate and martial arts shorts. All the videos are available to view at vimeo.com/levis. 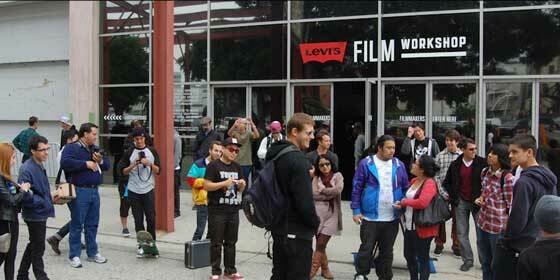 The Levis Workshops are a series of community-based venues dedicated to creative production and collaboration. For more information please visit workshops.levi.com.